FORT LEE, Va. (Army News Service) - U.S. sales of organic foods have grown between 20-25 percent annually for the past seven years, and during that time, the Defense Commissary Agency has more than tripled the number of organic products available on their shelves. To be labeled "organic," food must be produced without using most conventional pesticides, fertilizers made with synthetic ingredients, bioengineering techniques or ionizing radiation. With regard to meat, poultry, eggs and dairy products, organic means they come from animals that are given no antibiotics or growth hormones. "To ensure our patrons have available the products they want we keep an eye on trends. Because of this, you'll see organic selections on our shelves," said Patrick Nixon, DeCA director and chief executive officer Patrick Nixon. "Organic alternatives are side-by-side with similar nonorganic items throughout the commissary." To find organic products in your local store, look for the circular green and white "USDA Organic" seal, which is on items where 95-100 percent of the ingredients are organic. Use of the seal is voluntary, so some products may simply state "organic" on the label without using the seal. "If organic foods appeal to you, but their higher price takes a bite out of your food budget, make the commissary your first choice for purchasing organic," Mr. Nixon said. "Our overall price savings of 30 percent or more applies to organic products, too!" A new compact, eat-on-the-move assault ration is well on its way to warfighters’ hands. “The First Strike Ration is intended for the first-on-the-ground, first-to-fight warfighter,” said Barbara Daley, a food technologist and FSR project officer, Combat Feeding Directorate, U.S. Army Natick Soldier Research, Development and Engineering Center. Usually when warfighters are issued two or more Meals, Ready-to-Eat they “field strip” them to lessen the bulk and weight they are carrying. Personnel at NSRDEC found that not only were warfighters tossing what they considered extra weight, such as the flameless ration heater and Tabasco sauce, but they were also tossing food items. According to the Product Optimization and Evaluation Team at NSRDEC, if a warfighter is given 3,600 calories, he or she will often strip it down to 2,500 calories. The FSR attempts to reduce this stripping by providing a lighter, smaller package with eat-on-the-go items that also enhance performance. These items are calorically dense and provide appropriate nutritional content and energy to warfighters for short durations of highly mobile, highly intense combat operations. Items included in the FSR include pocket sandwiches, First Strike energy bars, Zapplesauce™-a carbohydrate-enhanced applesauce, high-energy drinks, pouches of tuna and chunk chicken, and caffeinated gum. The FSR is designed to be about half the size of the three MREs it replaces and it provides, on average, 2,900 calories per day. “It is not intended to sustain the warfighter for long periods of time,” Daley emphasized. Because of its lower caloric content, the FSR is classified by the Office of the Surgeon General as a restricted ration. As such, it can only be used as a sole source of food for ten days or less in accordance with Army Regulation 40-25. ALEXANDRIA, Va. (Army News Service) - There is still time to qualify for a chance to win a 2008 Ford Mustang, an all-inclusive, five-night stay at Shades of Green on Walt Disney World Resort in Lake Buena Vista, Fla., or Edelweiss Lodge and Resort in Garmisch, Germany, one of five $100 gift cards to military exchanges and commissaries, various electronic products or a mountain bike. Morale, Welfare and Recreation patrons who "Dress the Dog" at participating MWR food and beverage facilities can win big prizes simply by eating hot dogs this summer. Sponsored by Hebrew National, the "Dress the Dog" promotion features a frequency card program: buy six half- or quarter-pound hot dogs and receive a free quarter-pound hot dog from MWR. When customers redeem their frequency cards for a free hot dog, they can enter their name into a sweepstakes drawing for a chance to win the big-dog prizes. "We are enthusiastic with the way the 'Dress the Dog' promotion has been accepted," said Keith Elder, director of Business Programs at Family and Morale, Welfare and Recreation Command, in Alexandria, Va. "We are hearing that it is a big success and people are really enjoying it. Some of the facility managers are actually using the 'Dress the Dog' promotion to branch out and expand upon that idea and make it into an even bigger event." Heidelberg's MWR ran a "jingle contest" during their Fourth of July celebration, Mr. Elder said. The purpose was to create awareness for the promotion in the community. He said nine children shared their jingle with event attendees. Four-year-old Macaela Gray of Heidelberg took top honors with the best jingle. Armed Forces Radio will play her song as a means to advertise the hotdogs through the duration of the promotion. The "Dress the Dog" promotion is one of the largest promotions MWR has offered, said Roger Weger, chief of the Army's Branded Restaurant Program. The promotion is featured at all of the Army's branded restaurants and snack bars around the world. Mr. Weger likened the hot dog with fun memories and the experiences that children and their Families enjoy throughout the summer. "What's a picnic, a softball game, or a round of golf without a hot dog?" he said. The promotion, which began June 1 and runs through Sept. 30, is spearheaded by the Army's Family Morale, Welfare and Recreation Command Business Program Directorate. It is open to all branches of the military. "The U.S. Marine Corps, United States Coast Guard, and Air Force have already made this promotion available to their installations," Mr. Elder said. "We're happy to have the other military branches as partners to offer all military servicemembers this fun and exciting promotion." Commissaries also are participating in Hebrew National's summer retail promotion to "raise your hot dog IQ (inner quality)." As part of an effort to cross-promote the food service and retail promotions, Army MWR is facilitating placement of shelf talkers in the commissary, advertising both promotions and providing patrons with a second opportunity to win great prizes on-line. "The four-month promotion is designed to provide great food, outstanding prizes and overall service to all our patrons," Mr. Elder said. Approximately 100 facilities throughout the Army, Air Force, Marine Corps and Coast Guard are participating in the promotion. According to reports from managers, Camp Lejeune, N.C., leads the group with 12 facilities participating. "I think 'Dress the Dog' is a perfect promotion for this time of the year," said Mr. Weger. "The patrons love the frequency card, which then enters them into a sweepstakes drawing for a chance to win big prizes. "The managers love this promotion because it is simple," he continued. "Everything they needed is in the box that arrives at their location; all they have to do is open it up, put it up and they are up and running. So we are off to a good start and we are very pleased." To learn more about the promotion, visit www.mwrpromotions.com. (Ivar's release) – Ivar’s Restaurants and Seafood Bars are honoring each active or retired military guest with a free cup of Ivar’s award-winning clam chowder on Veteran’s Day, the federal holiday recognized on Friday, November 10. In addition, Ivar’s Seafood Bar in Kent is raising a special flag that day in honor of veterans. A retired United States Marine who wishes to remain anonymous, has a special place in his heart for that restaurant. Now retired after 35 years of military service, he awarded the Kent location a U.S. flag he obtained from the USS Arizona Memorial at Pearl Harbor. At 11 a.m. restaurant manager Kerry Thomsen will raise the honorary flag. It will replace another that flew over U.S. headquarters in Baghdad, also a gift from the veteran. The flag, properly lit after dark, will remain flying 24 hours day until it needs replacing due to wear, or until a different flag of special distinction is hoisted. 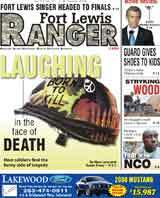 The restaurant flew a flag from the Ft. Lewis Officer’s Club recently too. A complete list of locations may be found at www.ivars.net.